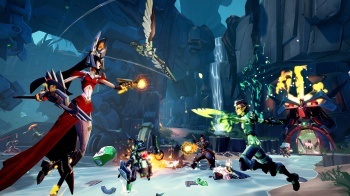 Gearbox Software CEO Randy Pitchford has squashed rumors that Battleborn is going free-to-play. Earlier today, a certain news outlet reported from an "unnamed inside source" that Battleborn was preparing for its imminent conversion from a fully-paid game to a free-to-play title. While it does make a bit of sense, concerning the unexpected popularity of the mechanically similar Paladins, and of course the overwhelming dominance of direct competitor Overwatch. Nonetheless, Gearbox CEO Randy Pitchford has firmly struck this rumor down via his Twitter. "We have some unannounced plans to do a trial version of the game that would be free and from which retail can be purchased along with DLC." Pitchford continued to engage with replies to his Tweets, addressing criticism of the game's "morbid" PC player population by explaining that "[the] team is looking at motivators to increase PC player base," and that the console player-bases are still quite healthy.